The photobooth is a natural prop for a music video. It's universally recognizable, requires no translation, and can evoke a wide range of feelings, messages, and eras. 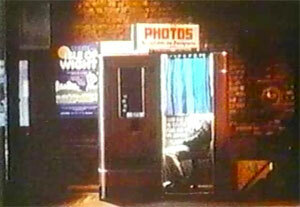 A photobooth can represent everything from pure nostalgia to drunken debauchery and anything in between. Music videos are a little harder to come by than movies and TV shows, but we have representatives from the last three decades, from a wide variety of artists: punk crooner Elvis Costello, American rock superstars Aerosmith, and synth-pop pioneers Depeche Mode. More videos using photobooths appear every few months, and we'll do our best to collect them all here. Please send in any videos you come across. Thanks!